At this point of time, somewhere in the world is April 1st, but not in the place, where I am writing this story! Spending most of the time on Stack Overflow, I just happen to notice something weird in the page. The Quack Overflow! It's a cute ducky in the bottom right of the page, asks if I need any help, which was rather weird. I was thinking it might be a nasty plugin, but thinking about Stack Overflow and using the browser in Incognito mode, I thought, okay this is not a BHO (browser helper object) or my Chrome is hijacked (coz there's literally no way it can happen due to my environment setup). I began by clicking on the ducky. Something weird happened again. Okay, fine, let me enable the microphone, but wait, what? I didn't get a request to enable or no sense of recording from my microphone device. At this point I was damn sure this is some kind of prank. But it showed me something like this! 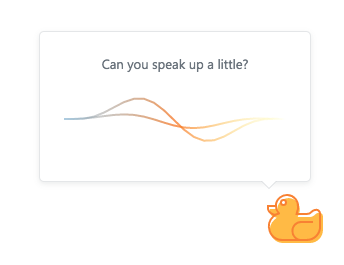 I am totally sure about the fact that I haven't been giving any vocal input to the ducky and woah, seriously? Now I am more interested. So I thought of using the No option for the microphone. I was really surprised to get this. With the magic of the internet, you can just explain your problem anyway! What? Seriously? Now this is a real prank. Ha ha. 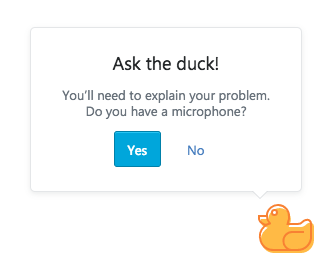 After a few seconds of shouting, no matter if I had the microphone on or not, I get the below message, which makes me believe that the duck is really listening. 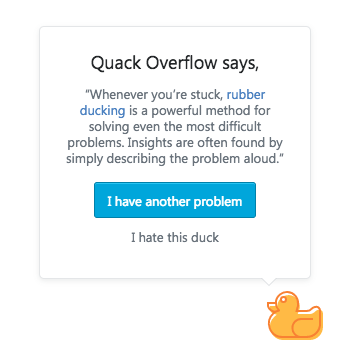 In software engineering, rubber duck debugging or rubber ducking is a method of debugging code. 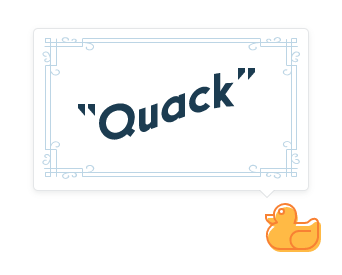 The name is a reference to a story in the book The Pragmatic Programmer in which a programmer would carry around a rubber duck and debug their code by forcing themselves to explain it, line-by-line, to the duck. Many other terms exist for this technique, often involving different inanimate objects. Many programmers have had the experience of explaining a problem to someone else, possibly even to someone who knows nothing about programming, and then hitting upon the solution in the process of explaining the problem. In describing what the code is supposed to do and observing what it actually does, any incongruity between these two becomes apparent. More generally, teaching a subject forces its evaluation from different perspectives and can provide a deeper understanding. By using an inanimate object, the programmer can try to accomplish this without having to interrupt anyone else. 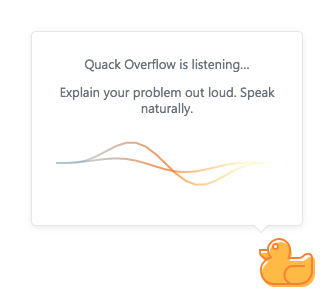 The duck in rubber duck debugging doesn't actually have to listen. The point is that you explain it and when you do that you'll understand the problem and arrive at a solution. 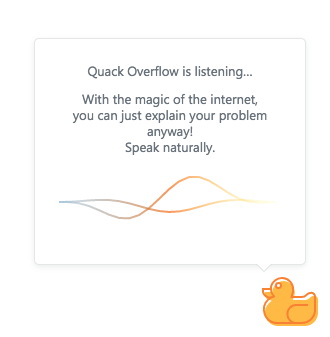 Quack Overflow is a little hard of hearing. Her ears were damaged when she was flying too close to a hunter when his shotgun discharged. Also, she is just a bit paranoid of microphones so we never enable yours no matter what you click. 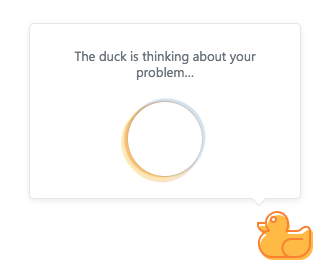 You can then either go for "I have another problem" which repeats the same thing over again or you could select "I hate this duck" so make the duck sorry to hear that and bid Goodbye, duck. How to send the duck away? Oh gawsh! 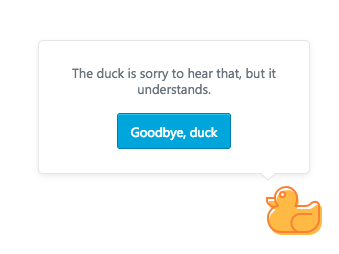 I accidentally bid good bye to the duck. I was not sure what I need to do to make it come back. Well, cookies make it come back! According this answer I found out that a cookie is being stored once you hated the duck. Deleting the cookie gets the duck back. The duck saves a quack in your cookies. 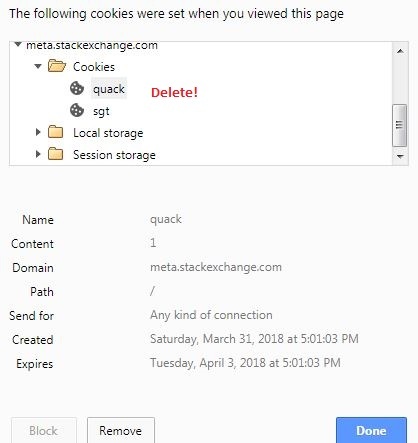 Open your browser's cookie collection and remove the quack cookie for the site where you want to re-enable Quack Overflow. For example in Firefox, right click on an empty part of the page, choose "information", then "security" and "show cookies". There should be a quack cookie with its value set to 1 for the sites where you disabled Quack Overflow. If you remove quack, Quack Overflow gets re-enabled. Note that you will need to refresh the page afterwards. Please take care when you follow the following guides, as wrong usage may make the Cookie Monster cry.